Small Business Smarts: Make Time For Your V.I.P. Client! 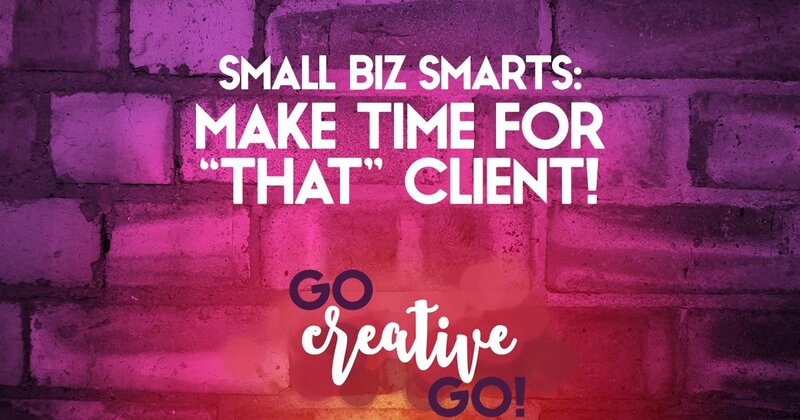 Small Business Smarts: Make Time For Your MOST Important Client! Paying the bills means getting the client work done! There’s no getting around it. But, consider this … what happens if you get the client work done and the pipeline is empty? Maintaining a steady stream of new and repeat business depends on you making some quality time for your V.I.P. client. Your MOST Important Client Is Y-O-U! This can be a bit hard to grasp, because when you work on your own site, your own content, your own visuals, you don’t see the immediate return on the time invested. You can’t invoice yourself. The effort you put in, the creativity you share, over time, builds presence, trust and expertise. All of this, and so much more, come together to create your brand. You + Your Business = Your Brand! Many a small business owner puts hours into creating a mood board, color scheme, logo and tagline. And then call it done when it comes to branding. How are you sharing your message with others? Are you actively bolstering your brand across social media channels? Are you creating content worthy of reading, bookmarking and sharing? Are you responding to queries and client ideas, on message and on brand, in a timely fashion? I don’t know about you, but I’m not impressed when replies to my emails, tweets and private messages are answered in a rush well after business hours. I don’t care that you deem yourself a night owl, I’m not getting the best you have to offer when I’m your last task of the long night. Your brand is the trust you build amongst your clients, prospects and peers. Doesn’t that deserve your best time and energy, your mind fresh and brimming with ideas? You should be blocking out time, EVERY DAY, that benefits your business. Time when your mind is fresh, not tired and ready to clock out. If the hours required to build your business are tedious, you just might be in the wrong business. Your brand and its management, maintenance and continued build should be as exciting as every project you take on for a client. Your brand and its messaging should not regularly fall to the bottom of your priority or to-do list. Of course you have to meet and exceed the expectations of your paying clients. You certainly can’t let deadlines slide, nor can you fail to deliver. But doesn’t your own brand, your own business, deserve the same effort, energy, expertise and excitement? Selling your small business, your products and services, requires your best efforts. Not the final few minutes before your brain completely ceases proper function. If you’re sandwiching the social media and other marketing of your small business between loads of laundry, how can you expect it to impress others? Sales must be consistent to successfully run a business. Your marketing, your branded messages shared, are part of your sales process. They’re the backbone of the trust building necessary to take a lead from prospect to contracted client. They must be consistent, timely, creative, and on message bits of your brand. That requires a sound, smart and savvy mind. That requires you setting aside the right time, the proper amount of time, the time your V.I.P client deserves. Your Business Is Your V.I.P. Client! Are you treating it that way? http://www.gocreativego.com/wp-content/uploads/2015/11/GCG-pinnable-important-client.jpg 1080 735 Mallie Hart http://www.gocreativego.com/wp-content/uploads/2016/07/GCG-sitelogo-new.png Mallie Hart2015-11-17 07:23:272016-09-20 13:08:14Small Business Smarts: Make Time For Your MOST Important Client! This is a great post! I really love your point that people may not be impressed if you send them a rushed response after-hours. I’ve never thought of that and will definitely have to keep myself in check! Thanks, Krista. Of course we’re aLL sometimes guilty of a quick end of night response. But if we do this all the time, our prospects don’t get the benefit of our best. What then will woo them to sign a contract? Multi-Platform Brand Marketing CAN Maintain Focus And Energy! Small Biz Smarts: Passion, Smassion! Smashing!